According to the U.S. Department of Transportation’s National Highway Traffic Safety Administration (NHTSA), 88,000 motorcyclists were injured in the United States in 2015. 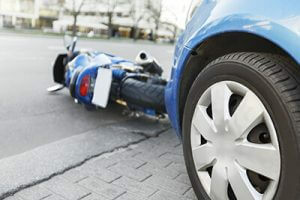 When involved in a motor vehicle accident, the motorcycle rider is more likely to be injured than the operator or occupants of a passenger car. The injuries that can result from a motorcycle accident are often quite severe due to the low profile of the motorcycle and the more exposed position of the rider. Dealing with the aftermath of a serious accident and resulting injuries can be a very complicated and stressful experience. You need the experience and advice of the Colorado Springs motorcycle lawyers at the Rector Law Firm to help you during this difficult time. The NHSTA reports that compared to accidents involving cars and other motor vehicles, motorcycle accidents are 27 times more likely to result in fatalities, and riders are at least 6 times as likely to incur injuries in an accident. If you’re lucky, you may walk away from a motorcycle accident with some bumps, bruises, and road rash. However, it is more likely that the injuries will be more severe, potentially requiring hospitalization, surgery, and/or physical therapy for rehabilitation. Recovering from these types of injuries can take time, and medical expenses will accumulate quickly. The statute of limitations in Colorado for personal injuries is three years, so time is of the essence after an accident. Victims are encouraged to consider contacting an attorney as soon as possible, as waiting too long could cause you to lose the ability to file a claim. The feeling of freedom from riding a motorcycle is an experience like no other, and in Colorado the riding season can be over far too quickly. Let us help get you back on the road as soon as possible. If you or someone you love has been injured in a motorcycle accident that was caused by another person’s negligence, our attorneys can help. At the Rector Law Firm, our Colorado Springs motorcycle accident attorneys have the experience and the resources to build a case that is designed to obtain maximum compensation for our clients. Call us today at 719-249-5572 for a free initial consultation and review of your case. on your behalf, you pay nothing.